With spectacular ambience and delectable food range, Cherish Elegance is your ideal multi-purpose Banquet Hall in Delhi! Cherish Elegance is a Banquet Hall nestled at the SPR Road, Vatika Chowk at Sector 69 Gurgaon. The venue is located within close proximity ie. 6 km from its nearest metro station- Sikandarpur, on the Yellow Line of DMRC. One can easily reach the venue through a 5-minutes drive from the metro station. 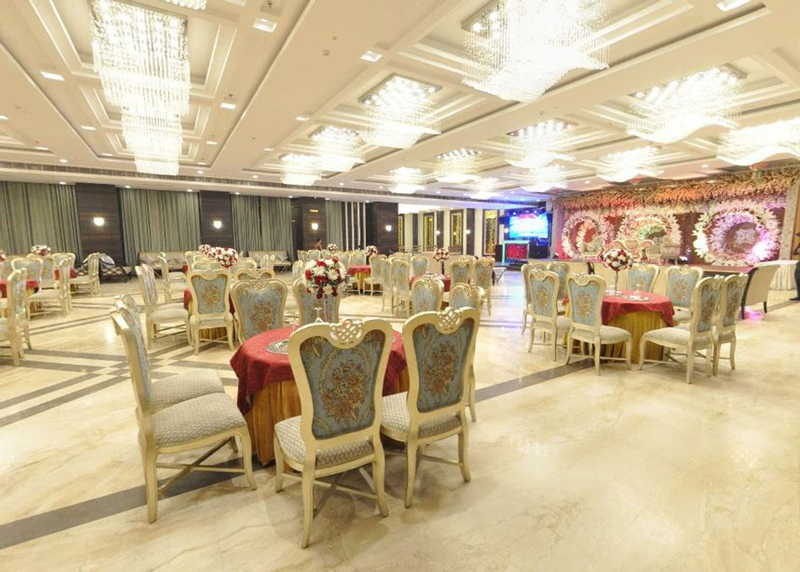 Cherish Elegance offers a luxurious Banquet Hall for your various indoor events. With a touch of English in the venue's plush interiors, Cherish Elegance stands apart with its state of the art ambience! The venue offers a spectacular backdrop in its ambience for your celebrations, to make them further memorable. The venue is gorgeously illuminated with jaw-dropping chandeliers and the contemporary designs of the Hall. While the Banquet Hall is bespoke and does not require to be decorated, Cherish Elegance provides you with an in-house team of decor panellist to add a touch of personalization to your celebrations. The lavish interiors of Cherish Elegance are sure to have your guests experience a memorable time at your event! Cherish Elegance is known for providing you with a unique and memorable culinary experience for your various events. The venue provides you with an in-house team of expert culinary chefs to cater to your event. Cherish Elegance serves a distinctively flavourous range of pure vegetarian food items from an array of local and global cuisines. The venue lets you choose amongst its multiple menu options, exclusively customized for your events, including High-Tea Menu, Social Functions Menu, and Wedding Menu. For your Cocktail celebrations, Cherish also serves a choice-variety of alcoholic drink and cocktails. Cherish Elegance is one of the most sought-after Banquet Halls in Gurgaon for all your Pre-Wedding Functions, Wedding Ceremony, and Wedding Reception. The multipurpose Banquet Hall is also ideal for your other events including Anniversary Celebrations, Birthday Party, Cocktail Party, Engagement Ceremony, and First Birthday Party. great wedding venue. service could have been better rest everything was fine. one of the finest wedding venues in sohna road gurgaon. the ambience is excellent and so is the food and service. booked this venue for my sister's wedding last month through venuemonk, had an amazing experience! We experienced amazing hospitality at this Cherish Elegance Banquets! Our entire event was up-to-the-mark, in terms of ambience, food, service. Would definitely recommend this venue for your wedding-related events.